Sept. 19—Since the publication of Part One of this series, catastrophic events–and the challenge of an appropriate response– have intervened into our nation’s life with Hurricanes Harvey and Irma. This series does not purport to present comprehensive plans for the infrastructure and great projects needed to mitigate these crises, but to examine why the nation seems to have a weakened reflex in response to such crises, from the vantage point of the solution. Only by shining a light on the failed underlying axioms of our current policy thinking, can we hope to rid ourselves of repeating the after-the fact half-measures we have seen with each recent disaster–or future ones, for that matter. Building adequate flood preparations for protecting cities (like Houston) from mass death is so obvious. Federal Capital Budgeting is so straight-forward. Why can’t we do these things? Although many are familiar with the Tennessee Valley Authority, the Rural Electrification Association (REA), and the Works Progress Administration (WPA), all of the Roosevelt era, how that type of American System approach might have been established as a scientific economic policy for planning the future, is currently unknown. But if we return to a piece cited in Part One of this series–“Policies, Standards, and Procedures in the Formulation, Evaluation, and Review of Plans for Use and Development of Water and Related Land Resources”–we can see how in the JFK era, systematic planning for the future was beginning to take hold. That document presents, as its title implies, an overall top-down procedure for planning, assessing, and budgeting for the nation’s total infrastructure requirements related to water and associated land resources. It was part of an overall offensive, which began around 1958, based in the U.S. Senate, to tackle such a vast problem from a top-down national perspective. When we have a government which is serious about aggressively attacking these basic needs for the survival of this nation, this document could serve as a touchstone to move forward. Kennedy’s Water Resources Council introduced through this document (published by the U.S. Senate as Senate Document no. 97), a new form of cost-benefit analysis as applied to future federal expenditures, creating a potential approach to capital budgeting, projecting the future from the standpoint of the General Welfare. In part one of this series, we introduced the idea that a Federal Capital Budget is a form of regulation of long-term investment, which frees investment in large-scale projects from the constraints of operating budgets and austerity. There is, however, a principle that must still first be introduced before discussing a multi-generational strategy like Capital Budgeting. To what end are we regulating? What type of future do we need to bring about? This question is overly broad to be fully answered in an article with a narrow focus, but still must be considered. The American System, as created by Alexander Hamilton, was the first attempt in modern history to craft a republic which would consider posterity as a scientific issue, and deliver the economic and financial framework to bring about a future based fundamentally on the idea of the General Welfare. The history of American System economics is the history of more scientifically defining how to approach making such decisions, which means providing content to the idea of the General Welfare. Where will proposed “great projects” of infrastructure position society one hundred years from now? Will we have adequate food, energy, water, housing, transportation, and other basic needs met for a growing population? Are our investments driven by the type of frontier thinking required, as embodied by a commitment to the space program? This approach considers technology the application of discoveries made in fundamental science, where scientific progress has always involved overturning existing axioms. Therefore, as JFK said, we go to space, not because it is easy, but because it is hard. Have we included in our strategy, the needed social infrastructure to educate and uplift populations to be able to assimilate new technologies and ideas? 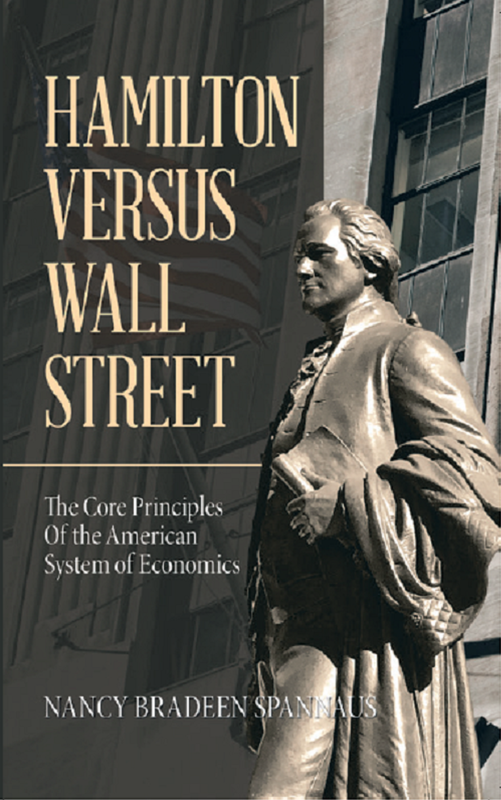 There is one key underlying assumption of the American System, which is a common precept of all the great American System economists, including Alexander Hamilton, Henry Carey, and Lyndon LaRouche. Contrary to the British Empire’s lackey Thomas Malthus, who claimed that the growth of the human race would necessarily outpace that of available resources, the American System holds that growth is enabled by human creativity, and therefore not subject to any inevitable “natural” boundaries of finite resources. In other words, it’s not about your i-phone. The 1901Pan-American Exhibition (where President William McKinley was shot), included an unprecedented display of electric lighting called the “City of Lights.” America was in the midst of being electrified, and revolutionized. Could we have, before that era, planned or projected needed improvements into the future, as a result of that shift of economic platform? Similarly, today. If we realize the needed breakthroughs in fusion energy research, and launch commercial fusion energy, how could we possibly plan improvements which would be needed after such a turning point? Under the American System, physical economy prioritizes investments which represent increases in productivity. That can be based upon either the proliferation of current technologies, or the development of new potential. Since we are looking at the role of government in driving forward the economy from a top-down perspective, one further step in our quest for Capital Budgeting is the issue of money. Accounting methods to regulate spending can be legitimate, if we approach money from the standpoint of credit, as well as the means of exchange of real goods. This is as opposed to money as a means of making more money. This approach requires the strict regulation of investment, to inhibit speculation, and the re-instatement of Glass-Steagall to remove government guarantees being given to financial institutions which engage in speculative risk-taking. China, the nation which is today leading the world in great projects, has acted to dry out speculative bubbles, as part of its drive to use state credit creation to finance infrastructure. A broader international approach to regulating money is a fixed exchange rate between international currencies, as seen under the Bretton Woods agreement, the bulwark for the fair-trade approach in the Post World War II era. Today, that could be combined with U.S. cooperation with the various investment funds set up by China related to both the BRICS nations, and the New Silk Road. These types of measures keep money as secondary to the real goals of physical economy, and when these pre-conditions are met, a Federal Capital Budget is feasible and needed. The level of total investment in infrastructure must be adequate to guarantee the rates of growth of the physical economy needed. Debt can be created to finance projects with the term of the debt equal to, or less than, the life-span of the project, but in no cases debt which will outlive the project. For most major infrastructure, such as railways, major dams, or sewer systems, the lifespan of the project would be 50, to a much as 100 years. Other projects may have a lifespan of a single generation, or 25 years, or sometimes less. The interest rate which is set for this debt must be lower than the anticipated rate of return on the project. Projects created under such a budget, create assets which may be jointly owned and operated with state and local governments, as well as with the private sector. Not listed here is the obvious: A Capital Budget is not the same as the operating budget. By segregating large-scale investments of a designated variety in a separate accounting mechanism, large-scale investment cannot be vetoed on the basis that it blows out the available annual revenue of the state. Forward budgeting, in this manner, allows for the impact of such investments to transform the revenue stream, increasing the real economy and thus paying for the investment. This proposed act, introduced in 1995 by Rep. Robert Wise (D-WVa), was the last legislative effort for serious Capital Budgeting. There are other, more technical issues concerning Capital Budgeting, which will not be covered in this article. In particular, there has been much debate concerning depreciation, and how that can be applied to a Federal Capital Budget. The basic issue here is that when a major capital investment is made, the cost is not taken up front, but divided through various calculations over a long period of time. This is also sometimes referred to as discounting. There was not a hiatus between 1943 and 1960–i.e. between FDR and JFK–on the thinking about the question of water and other infrastructure. But after 1943, when FDR was undermined by the Congress, there was not the same successful top-down drive, either. There was some success under Eisenhower, like Federal Highways, and even Harry Truman pushed some continuation of FDR’s emphasis on infrastructure. The Army Corps of Engineers continued to build. However, by the late 1950s, President Eisenhower began to curtail public investment in projects, vetoing numerous measures which would have funded major projects. He also, early in his Administration, adopted an executive budget directive, known as 47-A, which limited the allowable lifespan of projects to 50 years, and placed other constraints on projecting the total impact of such projects through cost-benefit analysis. In response, the U.S. Senate, upon the initiative of Senator Mike Mansfield of Montana (later to go on to become a famous anti-Vietnam War leader), introduced a measure, Senate Resolution 48, which opened the door for a major phase change in U.S. water policy. Out of that Resolution in 1959, a new Senate Select Committee was launched, headed by Senator Robert Kerr from Oklahoma, which in 1960 produced a report on water development which led to a major shift in the 1960s. That shift led to the 1964 launching of the North American Water and Power Alliance (NAWAPA), a mega-project which would have transformed the water-deprived Western states by diverting a small percentage of unused water now flowing into the Pacific Ocean. Senator Frank Moss, the key Senator promoting NAWAPA, also served on the Senate Select Committee. The Senate Select Committee, whose report should be read in full, placed a special emphasis on long-range development from the standpoint of new technologies, like desalination. As a result of its extensive nationwide hearings and cooperation with the Federal Agencies, a multitude of reports were produced, which this author has only begun to evaluate. One of note, was a study by the U.S. Geological Survey, which discusses the total water requirements of the nation from the standpoint of a “National Water Bank”. Many of the projects, including flood control measures, which were proposed in that period, were never built. Following the publication of the Select Committee’s report in 1961, President Kennedy, who certainly was aware and supportive previously as a U.S. Senator, moved to make water policy more united and systematic. That was the origin of Senate Document 97, cited at the beginning of this article. When Kennedy adopted this new unified standard for water projects, he first cancelled the directive 47-A. He intended to lift those restrictions, including increasing allowable project lifespan to 100 years. Senate Document 97, while not explicitly calling for segregating expenditures which are deemed appropriate for a separate budget, nonetheless represents a bridge between the American System and its associated idea of value, and those projects. It formulated a new type of cost-benefit analysis, and thereby a method for regulating major expenditures in light of the potential for increased productivity as a result of these investments. Therefore, the document gives the government a handle on a form of positive regulation. Just because some agency proposes a project which may have a 100-year life span, does not make it right. To what extent can the government foresee the impact of such measures, and operate under a unified approach to such decision-making? That is why this author believes that Document 97 is so revolutionary, and that Federal Capital Budgeting will not function, unless its approach is an included feature. Initially the document outlines the scope of concerns covered associated with water and connected land resources, which include considerations related to agriculture, flood control, pollution concerns, recreation, electrical power, and more. Federal agency efforts are to be integrated with all levels of state and local agencies that are involved. The document also puts a special emphasis on river basin planning, as the fundamental geographical unit for planning development. How intent President Kennedy was on unifying efforts in the broad area, can be seen by the nature of the membership in the Water Resources Council he assembled to produce the document. He brought together the Secretaries of the Interior, Army, Agriculture, and HEW. This section gives a detailed approach to weighing both tangible and intangible effects of projects, both in terms of their direct impact, and their broader effect, depending on the scale of the proposal. There are criteria set up for weighing alternative proposals. Where intangibles play a major role, the policy outlines costing out the impact of NOT building. Most extraordinary about this approach, are the proposed exceptions to the rules that are spelled out. Such an approach truly shows that, for those who understand American System economics as a constitutional principle, positive law in the case of procedures must never trump constitutional or natural law considerations. The report proposes establishing a discount rate (depreciation) equal to the interest rate of 15 year U.S. Treasuries. There are further details concerning uniform price considerations, costing out projects, weighing benefits, and much more. There are ten parameters of benefits from these water projects, which indicates the kind of cooperation and top-down approach Kennedy sought by adopting this as a unifying policy. These areas are: 1) Water supply, including both local and industrial; 2) Irrigation; 3) Water Control; 4 )Navigation; 5 Electric Power; 6) Flood Control; 7) Land Stabilization; 8) Drainage; 9) Recreation; 10) Fish and Wildlife. After the adoption of this policy, Kennedy introduced a bill concerning water resources, the National Water Resources Planning Act of 1961, which established a permanent National Water Resources Council. These measures were not to be realized under Kennedy, but were adopted in 1965 during Johnson’s Administration. Rebuilding the American System will be a fight. There have already been many casualties throughout our history. Let us not allow the crucial ideas, whose development has often been rudely interrupted, also be one of the casualties. And in that way a Federal Capital budget will provide a useful tool for the realization of our full purpose. See Beatrice Hort Holmes’s History of Federal Water Resources Programs and Policies, 1961-1970, US Department of Agriculture Publication (1979). This is a 300 page book, and Holmes’ second volume. The first shorter book covers 1800-1960.